Erin Square Condos is the place to be; a luxurious, convenience-filled lifestyle awaits you. It offers you an exceptional opportunity to be among the proud owners of a superbly constructed condo in a brilliantly developed community and sought-after locality. Erin Square Condos is a two-phased multi-storey condo project that will be stunningly constructed to an aesthetically spectacular façade to match the neighbouring landscape. This would actually be the fifth and sixth most recent building by Pemberton Group and also one of the last opportunities to buy condos near downtown Erin Mills. Erin Square Condos will consist of 1-bedroom +den, 2-bedroom +den, as well as 3-bedroom +den. Unit sizes will vary between 655 sq. ft. & 1155 sq. ft. Also, the building will have underground parking space. The condo amenities comprise 24/7 concierge service, classy lobby, alfresco terraces with barbeque, dining room plus kitchen, chic party rooms with bar, state-of-the-art fitness facility, Yoga area, and a huge 16’ x 46’ indoor pool together with steam rooms plus saunas. 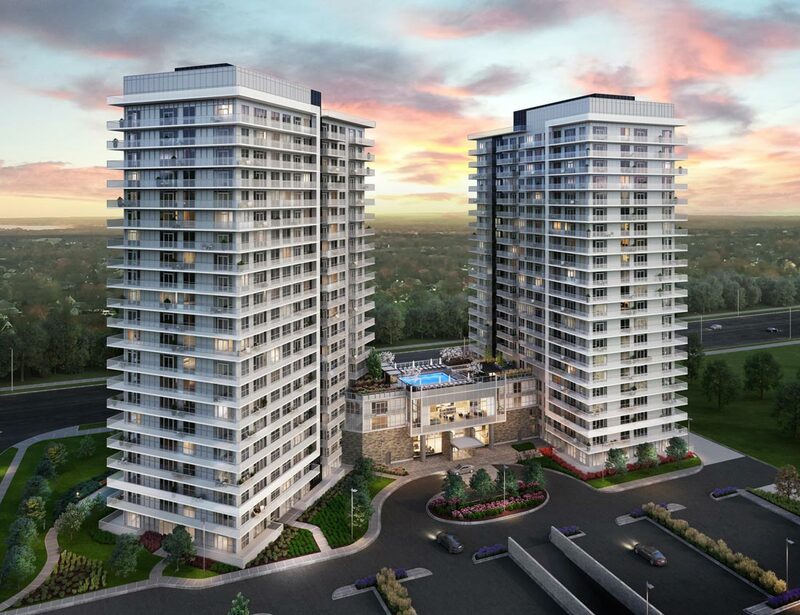 Erin Square Condos prime location allows residents to keep conveniently connected to Mississauga’s best. All shops, eating places and entertainment venues are a very short drive to Square One and few steps from Erin Mills Town Centre. The location is within a walking distance of most of the facilities. A few minutes’ walk will get you to the many parks, stores, eateries, bars and schools. Also, bus stations are just minutes away. Few minutes’ car ride will get you to the waterfront, or to enjoy the many boutique eating places and shopping in Port Credit. The condominium is approximately 35 minutes away from downtown Toronto, making it easy for residents to reach all the upscale amenities. The area’s closeness to a number of major highways, namely Hwy 403, 407 and Hurontario Street, also Erindale GO Train Station & Toronto Pearson International Airport makes travelling stress-free. Pemberton Group is a big name in the construction industry boasting of 50 years’ experience. The company is renowned for crafting both housing and commercial projects of top quality. The Pemberton team build each condominium with dedication, great talent and leadership, hence their occupants benefit from layout skill, excellent craftsmanship, and are flanked by the desired features and unique amenities. The developer’s condominiums are found in the greatest communities in the Greater Toronto Area.